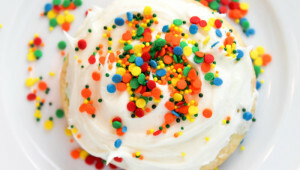 I’m a firm believer that everything is better with sprinkles. And after a two week hiatus from the real world, I could use a giant bucket of sprinkles to get through this back-to-reality Monday. 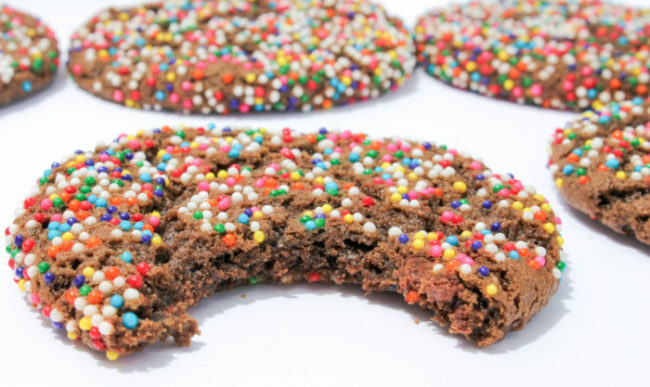 Or at least a giant batch of these Chocolate Sprinkle Cookies. 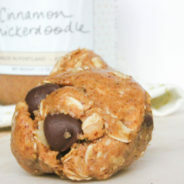 These are the perfect summer cookie for ice cream sandwiches, dessert for a cookout, or just a sweet chocolatey treat. 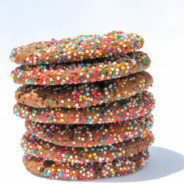 These cookies have the perfect texture of a crunchy sprinkle outside and a soft and chewy chocolate inside. But consider yourself warned, these chocolatey treats are highly addictive! These cookies are a happy accident. A wicked delicious one. I was up north for the past few weeks doing pretty much nothing but floating in a giant watermelon tube in the lake on the Cape for two weeks straight. After a week straight of doing that, a cloudy day was good motivation to get a bunch of recipes done so I have a backlog of sweet treats for the blog. I went to the grocery store and basically just did a Super Market Sweep of the baking aisle, including a giant container of rainbow non-pareils. 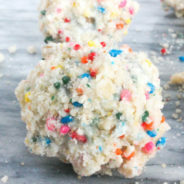 After making my Goat Cheese Sugar Cookies a few months back, I’ve been waiting to make another sprinkle covered cookie. 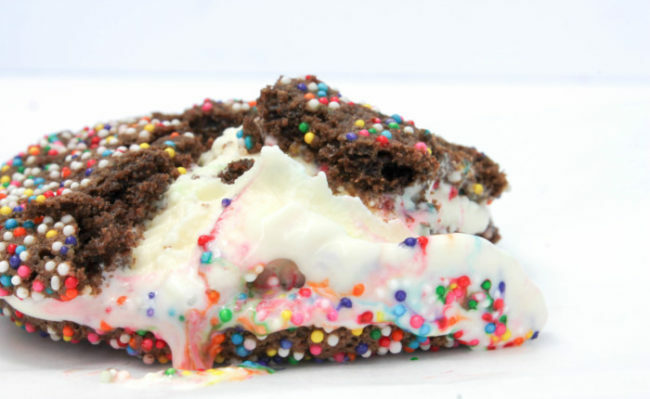 I’m not a big chocolate cookie person usually, but I’m a traditionalist when it comes to ice cream sandwiches and was looking to make the perfect chocolate cookie to sandwich around a scoop of vanilla bean ice cream. Now, don’t get me wrong. 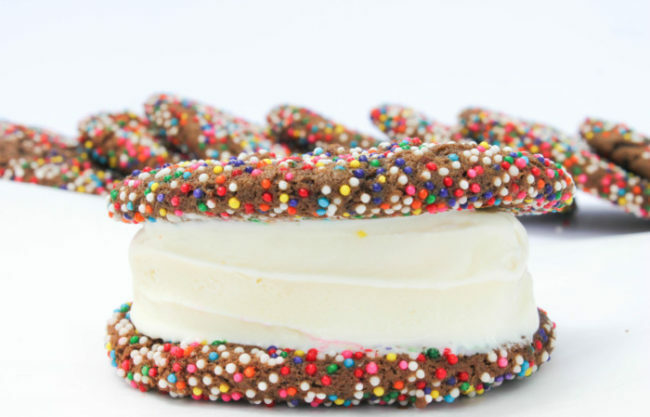 I love a Chipwich just as much as the next guy, but when I think Ice Cream Sandwich, I really think of those parchment wrapped Hood sandwiches with vanilla ice cream inside that usually melted halfway down your arm within a few minutes. Hell yeah. And for a split second I thought maybe I’d go all out and try to make a copycat Hood ice cream sandwich, but honestly I’m more of a function over fashion girl and I was on vacation, so this seemed like a valiant first foray into ice cream sandwich cookies. I had a quarter bag of Ghirardelli mini chocolate chips that I decided to throw in at the last minute, and I think they really made this cookie what it is. Delish. 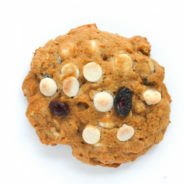 For someone who bakes as much as I do, I am usually pretty good at taste testing one cookie and giving away the rest. 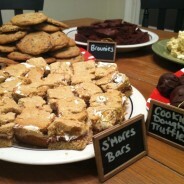 But these … well, I may have had to do a little extra quality assurance on this batch until I finally gave the rest away. 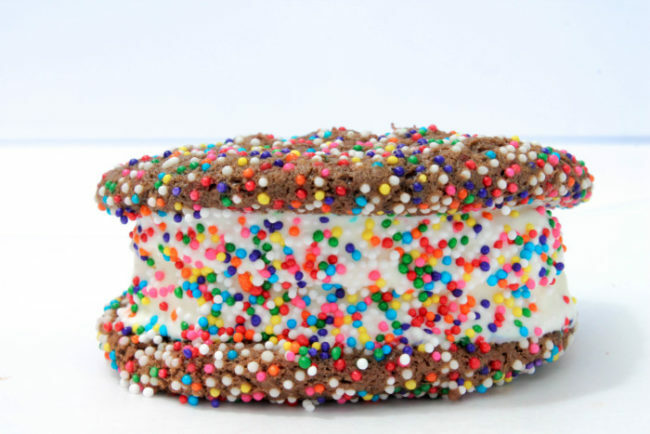 I also started making my ghetto ice cream sandwiches to enjoy at night, which is really just a lazy man’s ice cream sandwich – break up a few pieces of chocolate sprinkle cookie into a mug, microwave for 20 seconds, top with a scoop of ice cream and attack with your spoon. SO. DANG. GOOD. Thank god calories don’t count on vacation. 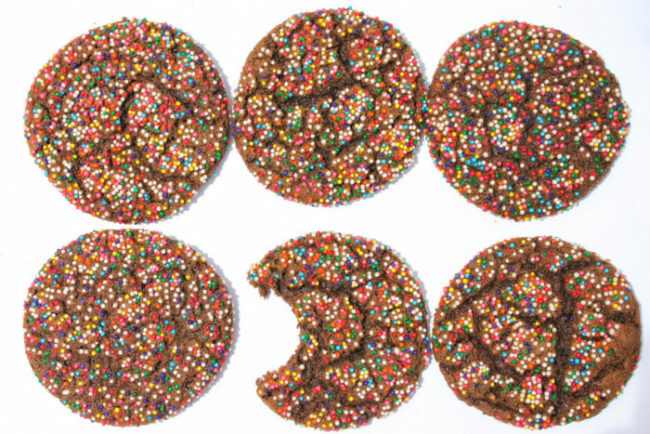 So if you’re looking for the perfect summer cookie, look no further than these Chocolate Sprinkle Cookies. Bake up a batch and sandwich a nice scoop of ice cream in between. Enjoy! 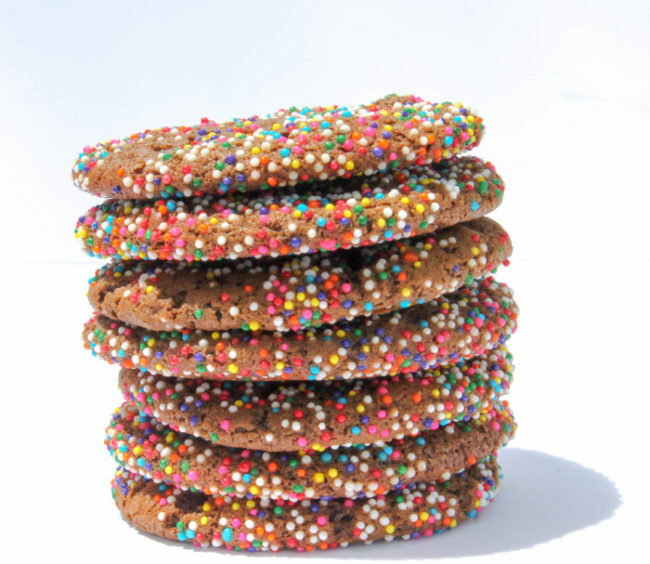 A soft chocolate cookie with a crunchy sprinkle outer layer, this is the perfect treat enjoyed alone or with a scoop of ice cream smushed in between two! In a mixer or using a hand mixer in a large bowl, cream the butter and brown sugar on medium speed. Add in the eggs and vanilla extract and beat well. Scrape down the side of the bowl before adding the dry ingredients. 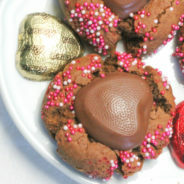 Sift together the cocoa powder, flour, baking soda, baking powder and salt and add to the dry ingredients on a low speed. Mix just until the dry ingredients are incorporated. Add in the mini chocolate chips and mix until evenly distributed. Chill the dough for at least 30 minutes to make it easier to handle. 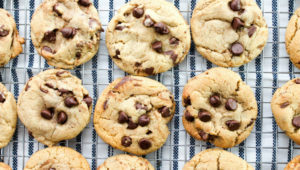 Preheat the oven to 350 degrees F. Once the dough is chilled, use a medium cookie scoop to roll out even-size balls of dough. Roll them in the sprinkles until evenly coated and place on a sil-pat or parchment-lined baking sheet at least 2 inches apart. Bake at 350 degrees F for 9-11 minutes. 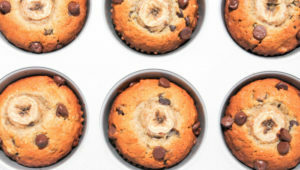 Let them cool on the baking sheet to finish setting before transferring to a wire rack to finish cooling. These are the perfect cookies to sandwich a nice scoop of vanilla ice cream between in the summer. Enjoy!